The Munster coaching ticket. Bitterness not pictured. I was going write something about Eddie O’Sullivan being overlooked for the Connacht post but Brendan Fanning did it this morning already. If Pat Lam is selected as Connacht coach then Ireland’s provinces will have four Kiwis at the helm. For a union so staunchly opposed to imported players, even if they have started families here, the IRFU’s approach to foreign coaches seems very inconsistent. Two of those Kiwi coaches are having very different experiences in Ireland this season. Rob Penney arrived with multiple domestic successes but failed to lead the Baby Blacks to another world title in the summer of 2012. He joined forces with Axel Foley, himself overlooked for the top role with his native province, and brought Simon Mannix along with him. Mark Anscombe struggled to match that success while at Auckland, where he was Pat Lam’s predecessor, but has been around the block as a coach, and coached his vintage of Baby Blacks to victory in 2011. Anscombe strikes the Mole as a ‘bottom up’ type of coach and an older style Kiwi, reminiscent of many of the men who led AIL clubs in the early and mid-90s. Indeed, Anscombe coached at Old Wesley during the 90s. Ulster’s early season training was rumoured to have concentrated heavily on fitness and they compete hungrily at every breakdown. Their body positions, particularly in mauls, suggested hours of physical preparation and contact drills. By contrast, Penney is a ‘top down’ coach who is determined to create a particular style of play in his squad even if it is at odds with what has gone before. He talks a lot about understanding the game and decision making. Anscombe has different material to work with than Penney. Johan Muller, Ruan Pienaar and John Afoa all have RWC winner’s medals. To put that in perspective, only players from 2003 onwards are likely to be playing this season and of that English squad that won, very few are still active (Jonny Wilkinson, Mike Tindall and Iain Balshaw are the only ones that spring to mind). From that select pool of 60-something players, Ulster have three. It’s quite a back bone of experience and ability. Ulster’s age profile is very good and it’s interesting to see the performance of two ‘older heads’ in particular this season. Paddy Wallace and Andrew Trimble face stiff competition from Luke Marshall and Craig Gilroy for starting spots and this competition has benefitted Ulster with the older men playing out of their comfort zone in order to keep their place. The Mole has long been a Wallace fan and is delighted that an extended run in the same position has brought out the best from one of the most talented footballers of his generation. The necessity of when to play young players and provide them with experience is a subject that’s fascinated me this season. There is no doubt that the Heineken Cup is the highest level of the club game in the Northern Hemisphere. It makes sense, therefore, to pick your best team as it is a priority, particularly with no relegation from the Rabo Pro 12. For the national team the priority is the Six Nations. The summer tour and November series provide an opportunity for the coaching staff to blood young talent. Should Gilroy and Marshall have started for Ireland during November? Absolutely. Should they start ahead of Trimble and Wallace for Ulster? I’d start Wallace ahead of Marshall in every big game on the evidence of the season so far while Tommy Bowe’s injury makes Anscombe’s decision about his wingers much easier. The performance of players that would not have been considered central at the start of the season has been a feature of Ulster’s play and none more so than Nick Williams whose recruitment was met with an air of disbelief in many quarters. The big man has been reborn at Ravenhill and is a different player to the one that spent most of his Munster career playing for Dolphin when he was fit. Anscombe’s team is playing with confidence, that elusive ingredient that makes all the difference. Their style of play is physical with Ruan Pienaar pulling the strings and Paddy Wallace adding creativity in the midfield. Anscombe seems to have been charged with the role of on-pitch coaching with Jonny Bell and Neil Doak as his assistants. Recruitment and other managerial issues that eat into pitch time are handled by the King of Ravers, qualified solicitor Davy Humphreys. As an aside, see if you can find Humphreys’ job listed on the Ulster website. I couldn’t, the role was created specifically for him and he runs the show. 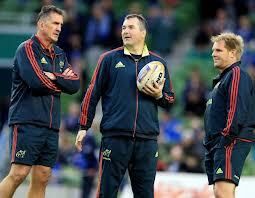 In contrast, Munster looked bereft of confidence against Cardiff. Rob Penney is constantly positive while his coaching partner Foley famously noted “bitterness and pride” as his primary incentives in a storied Munster career. The body language in the booth did not look good as Munster shovelled the ball from touchline to touchline without looking like they had a belief in what they were doing or how it would be ultimately effective. The Cardiff Blues, with Josh Navidi again outshining Sam Warburton in the back row, shrugged off the insipidity that has marked much of their season and saw Wexford man Robin Copeland get the game winning try. For the second time in a row Munster lost at Musgrave Park and the lack of atmosphere in Cork contrasted with the fervent arena of Ravenhill. Rhys Patchell seems to have added some confidence to the Blues and Warren Gatland must be watching his development with interest. We wrote about the challenges that faced the yet to be appointed Munster coach in April last year and noted that managing Ronan O’Gara’s exit from the stage would be one of them. Ol’ Red Cheeks is looking at contract negotiations after Round 6 of the Heineken Cup which seems to indicate that his Irish deal will not be renewed and the matter is in Munster’s hands. With Paul O’Connell absent, Munster have been denied a significant leadership presence, particularly when compared to the wealth of experience in the Ulster squad. An unhappy O’Gara now shoulders the burden of place kicking, seniority, contract negotiations and being asked to play a game he’s not suited for and doesn’t believe in. All yours Radge. Where that leaves the respective seasons remains to be played out but Ulster’s situation is far more positive and a Heineken Cup final in Dublin offers them their best chance of victory to date. They are playing with an intensity that Munster lack at the moment. Penney referred to “errors” as the reason for the defeat against Cardiff. You can quantify errors so it’s a reasonable response but Munster fans’ must be growing impatient with reason and wishing that their team would run through the routine once more from the top, with feeling. The structure of the Rabo Pro12 payoffs means that a top two place is almost essential to success as it is extremely difficult to win consecutive games against the form league teams away from home. Ulster have all but booked one of those spots with a cluster of teams gunning for second place. Leinster look the most likely to nail it down and Ulster’s biggest worries remain the battle on two fronts and where best to employ Ruan Pienaar. They’re a good sort of problems to have. P.S. Ulster have introduced my favourite chant of the season. One man asks the crowd to give him a ‘U’, then an ‘L’, then an ‘S’….until give me an ‘R’, give me an ‘R’, give me an ‘R’, give me an ‘R’ – ULSTERRRRRR! Brilliant. Note: Thanks to those who pointed out that this isn’t new. Still my favourite chant of the season. This entry was posted in Uncategorized and tagged Axel Foley, bitterness, give me an 'R', King of Ravers, Mark Anscombe, pride, Rob Penney by dementedmole. Bookmark the permalink. I only saw the 2nd half last night and Munster were very, very insipid. RoG kicked the leather off it and Cardiff apparently had 30 lineouts, hardly “Penney rugby” – curiouser and curiouser. What O’Gaga did last night was elegant but ultimately useless. Lovely kicks into space and touch that simply returned hard won ball to Cardiff. he is a defensive liability in a way he wasn’t before. He now doesn’t even bother to flap his arms in a pretend tackle. The opposition know he is so slow with ball in hand tyhat he has to pass and so they can rush up and deny the Munster outside backs any space. Munster never looked like scoring a try with him at 10. How many have they scored with him there this season as compared to Keatley? I’m really surprised that there isn’t a whirlwind of criticism aimed at Munster by their fans for fielding a weak side. Considering that apparently many thousands refused to turn out last week to see a full strength Munster because Ulster had a weakened team out. Lenihan blathered about it in the prematch t.v. Munster love-in. Tony Ward, he of the hot air bandwagon style of journalism, claimed that fans were rightly outraged and short changed because Ulster didn’t field what can only have been all their injured players against the ‘mightyness’ that lives in Thomond. This is tongue in cheek by the way. Most sentient rugby fans don’t give a pile of stinking fish for such bilge. We are well used to such snide slurs from these heroes. Munster fielded 10-11 first team players against Cadiff. They did? Wow! Talk about short changing the fans…. Again…for your benefit….Tongue in cheek. I’d say that Ulster’s weakened team was a big middle finger from Anscombe to the IRFU – after 18 months of bashing Ulster for daring to play 2 World Cup winners and a Grand Slam winner ahead of 3 young unknowns, the IRFU went ahead and withdrew both Paddy Wallace and Luke Marshall on the same weekend and also withdrew Paul Marshall despite clear signals from the Irish management that he is 3rd choice at best. That was one of the most shocking matches I have ever seen. Penney really lacked backbone when he didnt subsitite o’gara for keatley. That was the only viable option to get some decent attacking. Radge is completely past his sell by date, he didnt even attempt to tackle their 8 for his try. I never want to see him in a green shirt, and if I was a munster fan I’d be livid. Earls was disappointing in centre. Downey was the only one who showed some spark but he’s not being used effectively. I dont understand this Penney brand of rugby thats being bandied about, could someone explain succinctly what it is meant to be? – is it five forwards in five yards of space on the wings and the ball being shovelled along?.. I dont believe Munster need to ”revert” to their old style.. but what they do they need to do is regain is their formidable pack. I dont think the old munster had a monopoly on this fundamental of the game. They need to secure the breakdown and build phases , actually attacking the gain line and protecting the ball. I dont claim to be any strategist but this seems basic. The writing was on the wall last week against Ulster. How they must miss Williams? I believe Hook brandied him lazy. What a player reborn? Great stuff as usual lads. I have been on the get ROG out bandwagon as long as anyone (Heineken Cup last season after Round 2!, he can’t run a backline and while he can kick reasonably accurately, there is a big difference between kicking well and playing well. I think our backs in general have been poor enough under Mannix, I wonder whether it is worth keeping him personally, there have been only brief moments this year where we have produced super backplay. Musnter spent a lot of time shifting it across the pitch and going nowhere, few lines of running or anything akin to inspired backplay. From what I have heard from others, Penney’s system can be incredibly effective if used correctly, with certain characters in the Munster team it will never reach its potential, Keatley and JJ need to be given a great chunk of gametime. Munster haven’t scored a try in the HC this year that has had anything to do with ROG. An intercept from Downey that led to Howlett going over and Zebo’s magic v Racing Metro. Munster may go through a tough patch for a while after replacing ROG but it is something that will have to be done, let’s just get it over with already! Conor George in the Indo reported POM and Radge would be negotiating directly with the IRFU. Conor George is even more of a Munster fan than his predecessor, so I would take that with a pinch of salt. Surely, even the IRFU couldn’t give a central contract to ROG at this stage in his career. Sweet lord, I hope so anyway. To qualify that: Conor George does not seem to be an independent-minded journalist but a fan-piece author. If that’s what customers want, then there’s nothing wrong with it, but it should temper any objective analysis of what he writes. Just reporting what was said in the paper, couldnt give a fiddlers about the indo rugby coverage. I also hope he’s wrong but given some of Team Ligind who have gotten central contracts in the past when long past their peak it wouldn’t surprise me. Any chance your articles can ‘revert’ to accepted editorial standards? While your articles are always well thought out and generally very true and enjoyable reads, the use of phonetics and mildly disrespectful slurs such as ‘Radge’, ‘Embra’ and ‘Liginds’ is just annoying. Agreed, most insulting Mole, whoever you are. I don’t want to read this either but I’m forced to and you should write what I want you to. So there. I was at Musgrave yesterday. I have followed Munster since the amateur Inter-pro days so I am used to the good, the great and the bad. Yesterday was terrible. Munster played the three-direction strategy throughout the game – when they didn’t drop passes that is. They went left, right and backwards. I watched the television recording of the game today and have to say it didn’t capture how bad it truly was. The most accurate part of the coverage was Shane Horgan’s summation at the end. As an exercise in moving the ball wide at every opportunity it was flawed. The giving and taking of passes so poor at times as to seriously question players’ skills. Skills that individually and collectively they have demonstrated time and time again. Losing Murray and more especially Sherry didn’t help but the result would probably not have been a lot different had they remained. There appeared to be a malaise about the team, a lack of focus. Lets be honest. A Cardiff side only marginally better than the one thrashed by Leinster, easily won the game. It was as though the players parodied Penney’s system by running and passing laterally all the time, even the subs continuing the trend. Add in poor performances from Dougall, Downey, Murphy, Foley, Jones and Henry and it makes for a long journey back to Wexford. Downey wasn’t great, but he did get over the gainline a few times and looked one of the more effective Munster backs. It doesn’t help that with ROG not being a running threat he is running into a stacked defense most of the time. It’s hard to tell whether the problem is with specific players, a lack of a game breaker, or with the system overall, but Munster are a lot better than last night’s display. Completely unrelated to the major thrust of this piece- Simon Shaw is still having a trot for Toulon, but according to Wikipedia he doesn’t feel he really earned his World Cup Winners medal from 2003 and keeps it in a drawer. Maybe that’s why he’s still playing at age 39. Would he have been worth a punt at Leinster for this season? Hard, hard man. Great post. Super analysis as usual. I think if Penney wants his game plan implemented he will need a certain type of player- eg, a passer/offloader, dare-we-say-it, Laulala at 13. Though doing that would be akin to Bobby Robson dropping Shearer for the Toon. Howay! Love that stuff. Stakhanov! Gas!